The Northern Cape is the largest of the nine provinces in South Africa. It is a sparsely populated area and includes a diverse landscape from desert-arid to green-lush and everything in between. There are many private game reserves in this area, including larger reserves that are owned by the government. The Kalahari Gemsbok National Park is one such reserve and shares a border with Botswana. Together with the Gemsbok National Park in Botswana, they make up the Kgalagadi Transfrontier Park. In this province you will find the Augrabies Falls of around 60m in height. The original Khoikhoi residents named the waterfall Ankoerebis, "place of big noises", from which the Trek Boers, who settled here later on, derived the name Augrabies. The diamond mining regions in Kimberley and Alexander Bay exits and a visit to Kimberley would not be complete with out a visit to the Kimberley Diamond Mine, locally known as "The Big Hole". Most of the region is dry and arid, with stark landscapes, succulents and Boabab trees, until the spring that is, and then the Namaqualand region in the west becomes a sight second to none. 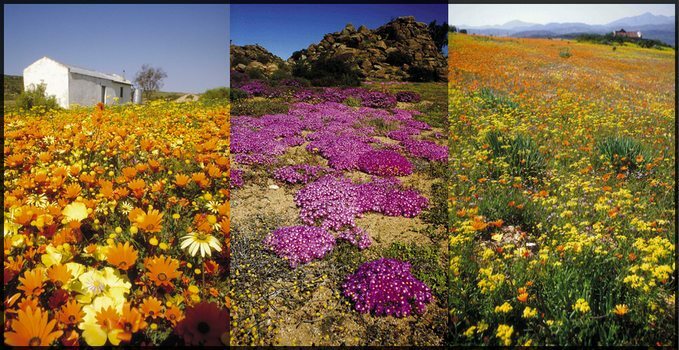 It is famous for its annual spectacle of Namaqualand daisy blossoms that carpet the area in hues of yellow, orange, purple and white. Words are inadequate to describe the fantastic sight that is witnessed once a year, and so I have included some photographs to illustrate my point. There are other areas to visit in this region. Western Cape Farm Holidays, and Eastern Cape Farm Holidays will give you a brief introduction of what you can see and do in the Cape Province. If you are looking for accommodation in these areas we have a few select farms that offer farm accommodation either as bed and breakfast, or they offer self-contained cottages. Eastern Cape Guest Farms and Western Cape Guest Farms show farm accommodation. If you have a farm in the Northern Cape that you would like to showcase visit our Farm Forum. You can upload a picture and brag a little. We don't mind! Share a farming story, tell us about your best or worst farm holiday and lots more. There are other individual farming discussion boards to contribute to through this forum, as well as a Craft & Recipes Forum where you can share your favourite recipes and also get some crafting ideas for various arts & crafts. The Northern Cape is where you can find the Kimberley Diamond mine, known locally as "The Big Hole"! They have a lovely open-air museum attached to the mine, and has recreated mining life as it was over a hundred years ago. Restored buildings at this historic site include a pub, a smoke shop and the De Beers family home. One can only imagine how rough it must have been for many of the miners. Some of my ancestors were miners here, lived in tents and the women packed guns to guard their daily finds and to ward off robbers who came to the unsecured tents for easy-pickings. The farmers in the Karoo are mainly shhep farmers, farming with Merino wool sheep and the Dorper sheep for meat. The farms that exist here have been farmed for generations. The only crop of any significance that is farmed here is the prickly pear, a lovely fruit, but with spines on the skin, it needs to be peeled very carefully! The Karoo has some fascinating towns that are steeped in history, Graaf-Reinet, in particular, is worth a visit especially for its historic architecture that has remained untouched and is preserved with pride by the community. A couple of kilometres, northwest of Graaf-Reinet lies the Valley of Desolation that is a lot nicer than it sounds. It is now a national monument and lies within the Camdeboo National Park. It was formed millions of years ago through weathering erosion that formed very unusual rock formations. There are some very good look-out posts where you can look across the valley floor to the town of Graaf-Reinet. Another town to visit in the Northern Cape, that is quite unusual to say the least, is Nieu-Bethesda set in the fertile valley of the Sneeuberg Mountains. Completely isolated with one road in and one road out of the town, it has less than a 1000 people and doesn't even have streetlights. The reason for its fame is due to Helen Martins, an eventual eccentric and reclusive woman who spent her days in the impoverished town making sculptures out of glass bottles and cement. Her property, known as the "Owl House" because out of all the animals she made, owls were more prolific, can be visited. You will be able to see the house where she lived and died, and the yard that contains her fantasy creations. My favourite town in the Groot Karoo is Matjiesfontein, fondly known as The Grand Duchess of the Karoo and after it was restored in 1970 became a National Historic Monument. It was here that Olive Schreiner lived with her husband. Schreiner being the authoress of "The Story of An African Farm." This is a town where there is a railway siding, and the Lord Milner Hotel with turrets and a corrugated-iron roof. Up on the wall of the hotel's bar wall, is an oil painting which holds endless fascination for my husband, as it is a picture of a schooner with the caption, "...captained by Kaptein Bax", which is my husband's uncommon surname. You can also go into the Standard Bank that is decorated wall-to-wall with hunting trophies of buck of all descriptions. See an old-fashioned petrol pumps in the middle of the main road, take a London bus around the town, and visit its two museums. There are too many places to mention, due to the vastness of the area, and really, I have only begun to scratch the surface of what the Northern Cape can offer you, the tourist. There are many farms in the area offering a wealth of farm accommodation, albeit guest farm accommodation, accommodation on game farms, wine farms, fruit farms, or even ostrich farms. If you are interested in coming to the Northern Cape for your next family holiday, then you are sure to find something here that will suit both your pocket and your taste. Looking for pictures on the Northern Cape? Or perhaps you are looking for posters on another category. Search here for the biggest online poster shop! If you can't find it here, you won't find it anywhere!